Back in 2008, I examined the Oreskes vs Nierenberg affair and concluded that Nicolas Nierenberg was correct and Oreskes was wrong. And then NN capped that by actually writing stuff up into a paper, published in July of this year: Early Climate Change Consensus at the National Academy: The Origins and Making of Changing Climate. William Nierenberg’s relatives disagree with our description of his role in the acid-rain debate in the early 1980s (Nature 466, 435; 2010). But their supporting evidence is a quote from The New York Times that is based on an interim report on acid rain, not on the final one. We maintain that Nierenberg worked with the White House Office of Science and Technology to weaken the final report on acid rain (Nature 465, 686-687; 2010), despite the consensus of the peer-review panel — articulated in the interim report — that acid rain was a serious threat. Historical documents from the White House and from Nierenberg’s own papers in the archives of the Scripps Institution of Oceanography (for details, see N. Oreskes and E. M. Conway Merchants of Doubt; Bloomsbury Press, 2010) show how this was accomplished, and reveal the concern of other panel members when they discovered what had happened. The final version of the report was largely irrelevant since the interim report published a year earlier already made headlines with the recommendation for immediate action… All of this was made further irrelevant by the fact that the completely unmodified version of the report was leaked prior to publication. Nierenberg was quoted on numerous occasions as calling for action on acid rain, and he never changed his view. I find it hard enough to keep my own posts in order, let alone anyone else’s, but: if you think *your* post deserves to fit into the list above, please mail/comment and if I agree I’ll add it. * Brian Angliss at Scholars and Rogues has what I’d regard as an unduly favourable “review” of Merchants of Doubt: the problem is that he has failed to pick up any of the problems I’ve noted above, and has clearly taken Oreskes word for stuff. For all I know she is good for everything but the above, but that doesn’t seem entirely likely. * http://nierenbergobservations.blogspot.com/ is NN’s viewpoint. And if you want to watch WN speaking, here he is (the content isn’t very interesting – std type of skeptic stuff around 1999 – calls Spencer and Christy’s stuff a “perfact thermometer” for example; spends a long time playing down the CO2 residence time; TOPEX/Poseidon sees no SLR). This is Hansen et al. fig 5, posted here so it shows up. See the comments for more context, and indeed my next post for even more. You’ll all be pleased to know that I’ve ordered a copy of “Scientific Perspectives on the Greenhouse Problem” by Jastrow, Seitz and; Nierenberg. Although I’m sympathetic to NN’s argument, and agree that he had strong points on some issues raised, they appear to be rather narrow and do not appear to significantly challenge the full body of evidence that Oreskes and Conway present in their book. It wouldn’t kill you to walk to a bookstore and read the relevant passages of the book. Just a suggestion. I am writing a paper on the subject. But I have all the relevant documents and I can tell you that the chapter in Merchants of Doubt (MOD) is highly misleading. As a very specific and critical point I refer to page 88 of MOD. They leave the reader hanging and never answer that question going off on a riff about Singer. But they know the answer. The OSTP press release in June 1983 was the original committee version. The one that, as they say, insisted on immediate action. No part of the Singer version made it in. The evidence is also quite strong that Nierenberg wrote that version with some help from Malvin Ruderman. So if they were being intellectually honest they would have given Nierenberg credit for issuing a very strong statement on the seriousness of the issue and the need for immediate action. But they don’t. They would also give him credit for numerous public statements on the issue, but they don’t. There was indeed some controversy over the editing of the executive summary in the final version, but that is really the whole story. I can get into more details about it if anyone is interested but the body of the report was unchanged by the editing controversy, and the position of the committee that action was necessary was very clear. Quoting from the executive summary of the final report. Amazon has search inside for the book. Nierenberg’s Amazon review points at pg 176. It would be helpful to get Oreskes et al. to agree on a list of all relevant documents, so we know you’re working off the same list, and all the authors to post the best copies you all (the extended plural you) have, for others to look at, somewhere. Scripps really ought to get a grant to do some digitizing and OCR work, but deciding what exactly is and isn’t relevant is more of a job for outside authors like you all. I just finished reading “Merchants of Doubt” – I’m wondering if NN has any comment on the many other problematic claims in the book regarding William Nierenberg, aside from the acid rain chapter? He is featured quite prominently on SDI, listed as turning down an offer to be head of the National Science Foundation in the Reagan administration, solicited his membership in the National Science Board, led a “no action needed” report on global warming, said to have “hated environmentalists, whom he viewed as Luddites”, falsely claimed there was no classified work done at Scripps. Nierenberg’s global warming report apparently advocated “migration” as an appropriate response to climate change… Reviewers commented on that and made other criticisms that the “claims in the synthesis were not supported by the analysis presented” but were ignored. Other NAS members apparently thought the report “was garbage so we just ignored it”. But the Reagan administration used Nierenberg’s report to counter EPA recommendations that the nation (this was early 1980s!) “should take immediate action to reduce coal use”. After Hansen alarmed congress in 1988, Nierenberg was then involved in a Marshall Institute book “Global Warming: What Does the Science Tell Us?”, which he used to brief administration officials. The briefing “had a big impact, stopping the positive momentum that had been building during the Bush administration.” John Sununu was paricularly impressed: “Sununu [was] holding the report up like a cross to a vampire, fending off greenhouse warming”. Specifically, the Marshall institute report had abused Hansen’s work, clipping Fig. 5 of his 1981 paper to imply that CO2 increase and temperature were *not* correlated, despite the fact that the full figure showed how they were. Oreskes and Conway compare Nierenberg to “Svengali”. A very powerful one. There’s far more than the acid rain chapter. And I don’t find NN’s defense there particularly compelling – after all, everybody agrees the final version of the report was *exactly* what WN later claimed Santer had done – edited without the permission of the authors to alter the meaning. But let’s hear how Oreskes and Conway did on the other claims regarding Nierenberg, shall we? I have read the book “Merchants of Doubt” and wrote comments in Japanese in my site. And then wrote part of the same thing as a comment to Brian Angliss’s article on Scholars and Rogues. By the way, Fred Pearce, in the Chapter 3 of his recent book “Climate Files”, says that the conference of experts held in Villach, Australia, in 1985 was epoch-making. I agree, though I disagree with his title “the secret origin of IPCC”. The report of the conference was published in 1986 as a report of ICSU SCOPE, and was famous among scientists then. Pearce compares the SCOPE report which included alerts and 1983 NRC report (possibly a different one) which just demanded more research. The rest is based just on my recollection. In 1983 (when I was a student), there was a kind of consensus among experts on the outlook of global warming (though the number of experts were few). But I do not think that there was consensus then that global warming would be a bad thing. (I remember Manabe showed projected reduction of soil moisture in interiors of continents such as U.S. Great Plains, but it was based on simulations of the world with a very idealized geography, so it was a matter of curiosity rather than anxiety to many.) Something has changed somewhat by 1985. Some say that the visionaries’ views were suppressed in 1983. My opinion is that it was the very research efforts (and funding, perhaps) which NRC demanded in 1983 that changed the situation. Specifically, the Marshall institute report had abused Hansen’s work, clipping Fig. 5 of his 1981 paper to imply that CO2 increase and temperature were *not* correlated, despite the fact that the full figure showed how they were. The original figure from Hansen et al is reprinted in the book (p 188). The Marshall report can be found here (published in Energy, you may need to pay). Oreske’s and Conway’s account is correct. My opinion on this issue is that we should distinguish norms of W. Nierenberg of Scripps Institution (WN@sio) and W. Nierenberg of Marshall Institute. (WN@gmi). I think that WN@sio was a leader of a scientific enterprise, and that WN@gmi was a minor member of a group of demagogues. Here is the original Hansen et al with figure 5. Re: Hansen 1981 Figure 5 and Jastrow/WN Marshall paper: Yeah, its pretty bad. 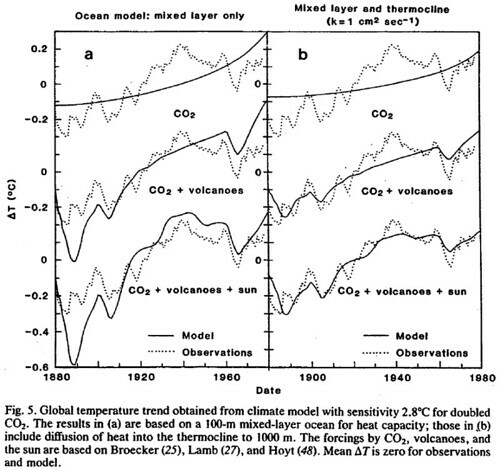 Hansen’s 1981 paper does a couple of things: it shows sensitivity of historical simulations to changes in ocean heat uptake, and then it shows how historical simulations change as one goes from CO2 only to CO2 + volcanoes to CO2 + volcanoes + solar variability. Naturally, with the right ocean heat uptake, volcanoes, and solar, Hansen gets a decent match. Jastrow/WN show a graph that they claim comes from Hansen, 1981, but: 1) just shows a CO2 only result, with no indication that there was any other work. The rest of the paper is pretty junky too. Basically, looking for any way to claim that a) CO2 doesn’t have much influence, and b) waiting 10 years to institute policies won’t cause any problems even if we’re wrong. Cite satellites, blow off aerosol research, do ad-hoc analyses to say that other papers are wrong, then blow off other papers by claim that they are ad-hoc, etc. etc. Nice to see so much interest. I don’t have time right at this second to respond to all of it, but I did want to comment on the Villaich thing. Since it was three years after the NRC report chaired by Nierenberg it wasn’t really relevant to my paper, but I remember glancing through it. Here is the conclusion from the executive summary. I don’t see any substantive difference between that and the 1983 NRC report. Hardly a clarion call for limitations on fossil fuels. Maybe someone else can find something? Oh, and Jastrow & WN align the Hansen historical simulation with their instrumental record so that they are both zero in 1880, rather than using Hansen’s centering. Kooiti Masuda wins the thread. He should go visit dotearth where Andy is asking is there a way to reconcile the personal and the professional sides of life as a scientist working on consequential, urgent questions? I can’t blog, but when I get time, that’s not a bad suggestion. Here’s my take. Oreskes and Conway have a narrative, and while it’s almost entirely fact-based, they may have tried to fit a few of their dozens of points into a square peg, round hole situation. NN, on the other hand, is engaged in some parental white-washing, and is relying on a forest-for-the-trees methodology that, ironically, is parallel to many issues in the book itself. The Marshall group was and is anti-regulatory shilling at the expense of science. The question at hand is whether or not WN was doing this prior or just subsequently. If NN has a huge body of evidence that points the other way, I’d love to see it, as I hate character assassination more than I even hate shills (who doesn’t, in their truest hearts, find S. Fred muppet-like adorable?). No one founds a hack shop like GMI to promote scientific integrity. The chapter on Rachel Carson is illustrative of how one goes about trying to discredit the unimpeachable. Might be a lesson there. Some people end up floating cheques over his transom. pough, you have just gifted me with the most valuable epiphany of my life: I’m not adorable enough. But I’ll work hard to correct that deficiency, starting immediately! Can I haz check now? I am not a historian myself, but I read books of history of science. I participated in translation of Spencer Weart’s Discovery of Global Warming. I also read Thomas Kuhn’s Black-body Theory and Quantum Discontinuity. I have almost forgotten its content, but I remember one of his remarks. (As I remember) Kuhn said that something which people say about their own thought in early days are not always trustworthy as historical evidence, especially when the paradigm around the subject has been changed. People tend to unwittingly re-interpret their past thoughts in the present framework of concepts. Mixing information at different era without taking proper care would be fallacy of anachronism. I think that the way of doing climate change science was changed in late 1980s. It is difficult for us now to imagine how we discussed climate change in the world without IPCC. So we must be careful not to mix judgement about W. Nierenberg after he left Scripps Institution in 1986 when we judge the attitude before that. Similarly I cannot fully trust myself about what I was thinking in 1983. I hope that historians of science would examine evidence. Thingsbreak. I understand your objections to the GMI. But I would argue that they were operating in the open with their mission and people clearly identified. There is no reasonable connection to the tactics of the tobacco companies. As to Nierenberg prior to 1990 you can start with our peer reviewed paper, or just look at the evidence that WMC put together. Then I would suggest that you simply read the acid rain report and compare it to the impression that you get from reading chapter 4 of MOD. Re (9) – sorry to be slow responding (on vacation!) – in my comment #6 here anything in quotes is a direct quote from Merchants of Doubt (in some cases where they quote something else), if not in quotes it’s a paraphrase. I’ve not done any separate investigation, I was wondering what NN’s thoughts were on the many other allegations against WN in the book, given that his letter concerned only one chapter (the acid rain question). which I took to mean that NN agreed that the final report was indeed different from the leaked early version. Perhaps not? The three page executive summary of the final report was modified from the originally submitted version. All of the original points remained but some material was added and there was some editing. These changes were suggested by the OSTP. The body of the report was unchanged. The call for immediate action remained. Nierenberg sent the revised version to Malvin Ruderman for comment, and Ruderman suggested some minor changes to the OSTP version. The version sent to Ruderman had some mark up on it, and Ruderman claimed that he didn’t realize at the time that there had been changes before the mark up. Nierenberg claimed later that he didn’t realize this either at the time, but in looking at the original and revised versions after the fact he could see why people felt they were different. I would encourage anyone interested to read the final executive summary. To me the committees conclusion that “the ecological problems that clearly result from man-made acid emissions are sufficiently well substantiated that additional reductions are required to prevent even more consequential environmental effects” comes through clearly. Actually I just read your question more carefully. The early version I referred to there wasn’t leaked but was issued in a press conference by the OSTP in June 1983. That section titled “General Comments on Acid Rain” was published exactly as the committee submitted it. The controversy was that in March 1984 the committee submitted a final version of the entire report to the OSTP including a short executive summary. It was this version that was leaked to the press prior to publication of the final report in August 1984. In the published version the executive summary was modified as described in my prior post, the rest of the final report was published exactly as submitted. Isn’t this all avoiding the real issue, that acid rain turned out to be hugely overhyped. The big die off didn’t ever happen. NAPAP spent 300 million dollars proving acid rain wasn’t a problem and the original stand of German trees were not in fact killed by acid rain at all. Von Storch comments that this overhype backfired badly on scientists and environmentalists, who henceforth were not believed. Not to say we shouldn’t be concerned about what comes out of chimneys. But at some point we have to look at the reality: That somehow nature just copes with it! Who to believe? JamesG or the EPA’s summary of the science. The enlightenment is that denialists are capable of multi-tasking their denialism. Eh, what, NAPAP showed what? Perhaps JamesG could provide some evidence for his claim? Excuse me, I find a typo in my comment #7: Villach is in Austria (Europe), not in Australia. I come to this article again because another blog discusses Oreskes who is now visiting Australia (in the southern hemisphere). Previous Previous post: Accelerated warming of the Southern Ocean and its impacts on the hydrological cycle and sea ice?